You're about to learn how to make the coolest frozen mojito! 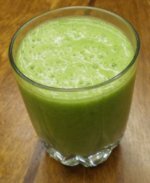 You’ll never believe that this super delicious tropical drink is actually a healthy green smoothie in disguise. I absolutely love mojitos, and they are my mixed drink of choice when I go out to a bar. But the mojito drinks in bars are loaded with sugar and alcohol. Not so healthy. And they’re quite expensive. So years ago I searched the internet for a good mojito drink recipe, and learned how to make my own mojitos at home, just the way I wanted. Lately I have been cutting back on drinking alcohol, especially hard alcohol. Not because of any strict rules or anything, just because I find that as I fill up my body with healthy foods that make me feel good (such as healthy smoothies), I crave less of the stuff that’s bad for me, and naturally stay away from hard alcohol. But then summer rolls around and I’m craving that unique mojito taste. What to do? Finally, problem solved! I invented this frozen mojito recipe that has that same delicious taste as regular mojitos, but in smoothie form! 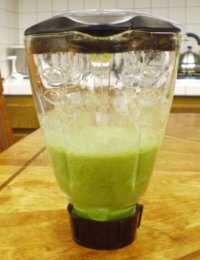 I make this smoothie without alcohol…it’s the mojito flavor I crave, not the rum. But feel free to add some rum if that’s what you’re after. Throwing a party? This frozen mojito drink recipe is perfect! Party guests will love the mojito taste, and it’s much easier on you, the host, instead of making a ton of individual mojito drinks by hand. It’s fast, easy and fun. Or maybe you’re just craving a special treat, something different from your regular everyday smoothies. This is definitely a fabulous treat, especially on a hot afternoon, or for a night in. What Makes This Smoothie So Good? The mint and lime are what give the smoothie its mojito taste. You don’t want to go overboard on either ingredient though, because they both have strong flavors. The banana adds natural sweetness and, like the spinach, has a mild flavor, so it won’t compete with the mint or lime. Add a bit of honey if you want to make it sweeter. But you don’t need too much, because the other ingredients already make it quite sweet. Add all the ingredients to the blender, in that order. Start with a small quantity of ice (a few ice cubes), blend for a while, then taste it with a spoon. Add more ice if you want a thicker consistency or add more water if it is too thick and hard to blend. This recipe makes about 2 cups...1 big serving or 2 smaller servings. If you’re throwing a party, increase the quantities accordingly. And consider serving these mojitos with fun straws, and maybe garnishing it with fresh lime wedges. Your friends will love these mojito drinks! I almost forgot to mention... Want to know the best part about this mojito smoothie? It’s actually super healthy! Yes, that’s right. It’s actually a green smoothie in disguise. 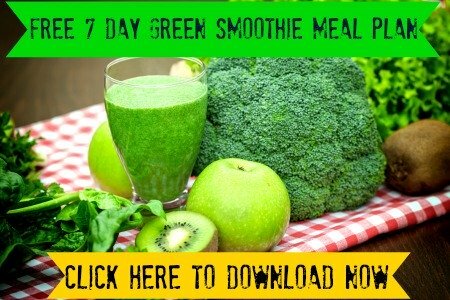 Click to read more about the amazing health benefits of green smoothies, or read more about spinach nutrition or banana nutrition. Isn’t it great when you can turn a guilty pleasure into something that’s actually good for you? That’s why I love this frozen mojito! Update: The same day that I created this Mojito Smoothie Recipe, I told my sister about it and she made her own variation! She added milk instead of water, and a little bit of Greek yogurt, and she loved it! She enjoyed her creamier version of this mojito smoothie. What about YOU? Did you like this frozen mojito smoothie? Did you make your own variation of this tropical frozen mojito smoothie recipe? Share your reviews, comments and variations or comment on other people’s submissions today. Want to make more healthy fruit shakes? Click here for more Fruit Smoothie Recipes. Surprised that spinach in a smoothie can actually taste good? Here are more Spinach Smoothie Recipes. Looking for another healthy party drink? Check out this guilt-free Pina Colada Smoothie Recipe.